Provence seems to be nearly everyone's favorite bit of France. The natives are friendly, the summer weather is superb, the wine is good, and a pastis before dinner is delightfully numbing as you sit in the shade with little more to do than plop tiny, clear, and perfectly formed ice cubes into a cloud of anise-flavored liquor. With landscapes often exceeding the expectations of frequent travelers, the rural good life can get no better on the eyes. 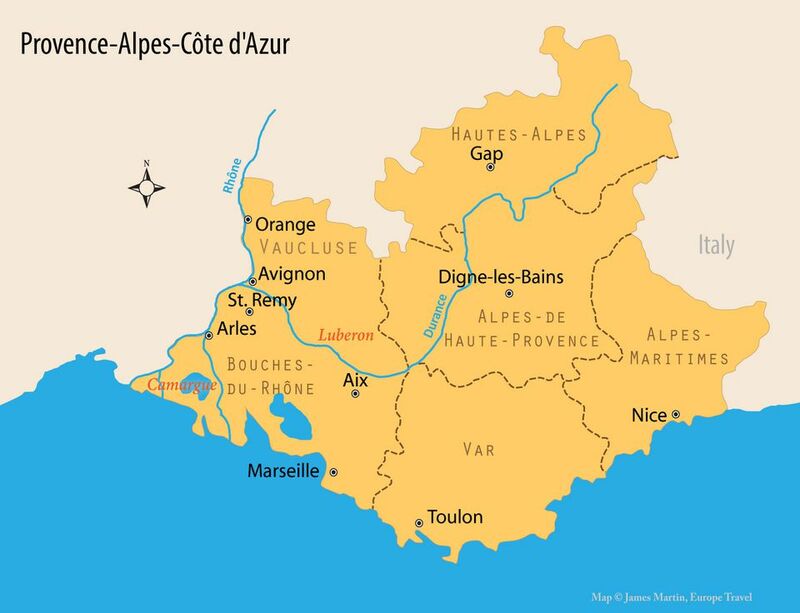 The modern Provence-Alpes-Côte d'Azur is divided into the six departments you see divided by the brown dashed lines: Bouches du Rhone, Var, Alpes Maritimes, Vaucluse, Alpes de Haute Provence, and Hautes Alpes. But the traditional territory of Provence is a bit smaller. You get there by lopping off the Hautes Alpes, the northern part of the Vaucluse above the Luberon, and the bit of the Alpes-Maritimes east of Nice. The departments to the west--the southern Vaucluse and Bouches du Rhone--are bordered on the west by the Rhône river. These two departments are generally what tourists think of when they think of Provence. To further muddy the waters, Peter Mayle's books refer to Provence but usually are written about just a part of it, the Luberon, which is mostly in the Vaucluse. The Luberon has as its backbone a mountain range that forms a sort of climate wall, a boundary between the warm and dry Mediterranean climate of the south and the cooler alpine influence on the north. Still, many people consider the Luberon to be the heart of the "real" Provence. Arles - First inhabited by the Greeks, but made most of by the Romans who left a theater and amphitheater for tourists to gawk at, Arles used to be a thriving port city before it silted up to become the marshy Camargue. Van Gogh chopped off his ear here -- and produced some of his best work as well. Avignon - Spend a perfect 24 hours in this spectacular city with the must-visit Palais des Papes (Palace of Popes) as well as other sites and a compelling old town. Parking outside the gates, on the other side of the Rhône, isn't as difficult as you might think. Camargue - See a different side of France, a France of cowboys and bulls and fantastic bird life in the salt marshes. St. Remy de Provence - Founded by the Romans as Glanum, this city has lots to see, Roman or no. Outside the town is the Ancient Monastère de St- Paul-de-Mausole, the 12th-century monastery converted to the psychiatric hospital where Van Gogh was admitted and where he produced some of his most famous paintings, including Starry Night. Nostradamus was born in St. Remy as well. Les Baux-de-Provence - Bauxite was discovered here in 1821, and Les Baux seems to rise up out of the old quarries. It was once a thriving little village with a castle, now in ruins. A favorite of tourists is the Sound and Light extravaganza called Carrières de Lumières that runs from spring until January. You'll learn of the artists that came from Paris in the second half of the 19th century to paint the light and colors of the Mediterranean south, creating artistic movements as they toyed with technique: Impressionism, Pointillism, and Fauvism up to Chagall. Orange - If you like well preserved Roman ruins, you'll love the theater and arch found in this Provence town, just 21 kilometers north of Avignon. Marseille - This city has gotten a bad rap, especially the port area. But it's all been feverishly rebuilt and polished, and it's looking very, very pretty. Notes: It is an easy 5-mile walk between St. Remy and Les Baux. The Pont du Gard is between Orange and Nimes just off the A9 and is easily visited if you have a car. Provence typically has dry summers and cool, wet winters. May, June, and September are good months to travel to Provence. France's second largest city is hot in June and July but cools rapidly to a comfortable high temperature in September. Spring has less rain than fall. Summers aren't blistering hot as a rule, but Provence gets quite crowded in July and August. The main Airport in Provence is Marseille Provence Airport located north of Marseille. Nice-Côte d'Azur (NCE) Airport is also an option. The Hotel Les Magnanarelles in Maussane les Alpilles, south of St. Remy is a reasonable value, although the rooms seem less charming than some hotels in the area. Get a room by the pool to stay away from street noise. A double room is about 60 Euros. The area is one of the best for French olive oil and is central to the places discussed on this page. The charming little towns of Provence make it a perfect place to explore by car; thus, it's one of our recommended Rural Self Catering suggestions. HomeAway lists 1300 vacation rentals in the area. A week in Provence isn't nearly enough to see everything. If you'd prefer to leave the driving (and the planning details) to someone else, you may enjoy a coach tour to see the main sites of Provence, like those offered by Viator. Smaller and focused group tours are offered by such companies as Provence Escapes and The Luberon Experience. Avignon is tucked inside 800-year-old stone walls just a stone's throw away from the Rhône river. You've come, of course, to see the Palais des Papes, the Palace of the Popes, which confronts the visitor with a sort of gray austerity which fails to hide its glorious excess as the world's largest Gothic palace. The Pope's Palace isn't the only UNESCO World Heritage Site. A short walk from the palace takes you to the second big attraction: the 12th-century Avignon Bridge called the Saint-Benezet bridge after the young shepherd who heard divine voices instructing him to construct it. By the time you've explored the Palace interior with your audio guide and walked across the bridge a few times, you might feel like sitting a spell and just enjoying some shade in one of the lively cafes. You're in luck. The town's squares are shady and welcoming; have a glass of the famous Tavel or Chateauneuf-du-Pape. Avignon is worth a stay of a few days. The city can be reached via the fast TGV from Paris. Rent a car at the Avignon TGV station called Gare d'Avignon, the regular rail station, or the Avignon AVN airport. You know that Vincent Van Gogh famously lopped his ear off in Arles and that there's a Roman arena there that still hosts events of all kinds. But Arles is a very pleasant town in Provence to spend a few days exploring. Near the Rhône, for example, you'll find the 4th-century Baths of Constantine. Market mavens will love getting gloriously lost in the largest market in Provence held on Saturday mornings. Arles has a train station, so you don't even have to rent a car to see it. The Abbey of Montmajour is found just outside of Arles on the Fontveille road. The Abbey stands on what was once an island surrounded by marshland and only accessible by boat. The Abbey started out as a fortified Benedictine monastery built between the 10th and 18th centuries. It is a very interesting visit. The Tower of Abbot Pons de l'Orme is a 14th-century tower you can climb to get an overview of the Provence countryside. It was built to fortify the monastery during a turbulent period of war and the Black Plague. It has a Machicolation, an opening from which to drop heavy things on a marauder's head. It derives from the French for "crush neck." Another war also took its toll on the Abbey. In 1944, a fire broke out in the Abbey's church, which the German army was using as an arms depot. Just a short walk outside the Abbey is the interesting Chapel of the Holy Cross, a masterpiece of Romanesque architecture, which was built to house a piece of the true cross acquired by the Abbey. There is a lot more to see in the Abbey, which incorporates art and other exhibits into the buildings. Get an audio tour and plan to spend several hours if not half a day there. Explore the wild countryside of this rich, fertile, and salty Rhône river delta with kids if you have them or can borrow a couple. Salt has been extracted here since Roman times. French "cowboys" called les gardians herd special Camargue cattle that roam the marshes. The Parc Ornithologique is a haven for big delta birds; the unworldly sounds and screeching of flamingoes will stay in your mind for a good while. You don't have to just stay on the sidelines and watch all this. A fine way to see this countryside it on the back of a sturdy horse. Those are special here too and easy to rent for a day. 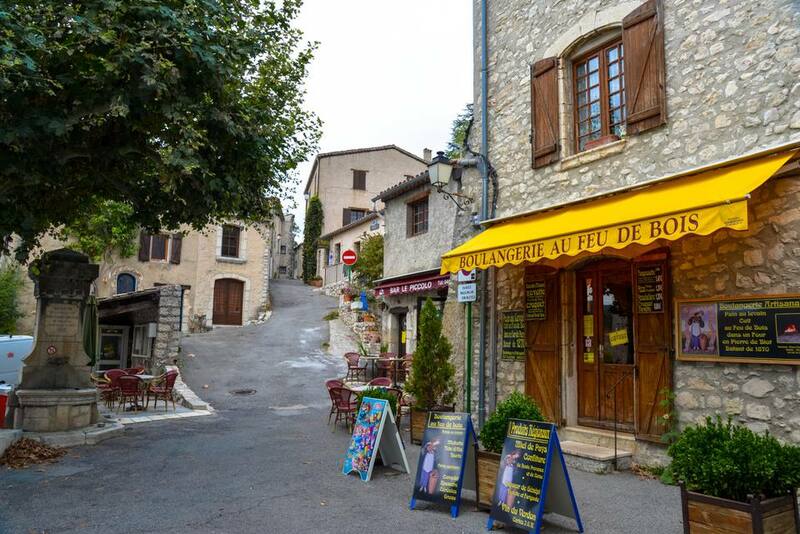 You'll find lots to do in Saint Remy de Provence, especially if you're a walker. You can see many of the landscapes featured in Van Gogh paintings right down to Glanum, a Roman archaeological site Van Gogh also painted. There's a fine lunch on the way, and a visit to the restful place you see in the picture, the Saint Paul asylum (Maison de santé Saint-Paul), where they've kept Van Gogh's room just like he left it in 1890. Of course, if the relaxing nature of Provence is what attracts you, and you want to stay in a place with fine cafes and interesting restaurants, Saint-Remy also has those.